The VA PAISLEY AUTHENTIC LONG NAVY T-SHIRT is apart of the VA-Garments New Authentic range apart of the Tailor Made range for Autumn & Winter. 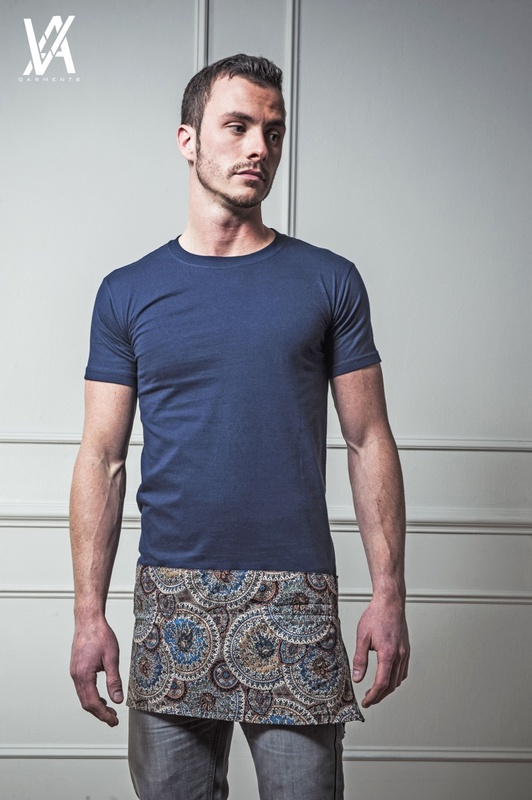 On the top half the long T-shirt is made from high quality navy cotton, it also features a unique paisley fabric made from silk and polyester located on the bottom of the t-shirt and to finish it off a gold zip running down the side of the paisley fabric . It details and unique cuts only exclusive to VA-Garments. This luxurious top is one a kind, which will be great for all year round. As the t-shirt has been extended at the bottom this gives it that unique edge. This is an exclusive and iconic product for VA-Garments. The Tee is an absolute MUST HAVE for this year!!!! !